This Vine Life: Let's Party! I love to plan parties. I love to help other people plan parties. It's their money, their guest list, ultimately their stress. I actually love the idea of hosting my own parties. Then reality sets in - a) there just aren't enough hours in the day, b) I'm not made of money and c) I'm no Martha. Fortunately, I have a good support system in place when it comes to this sort of thing. 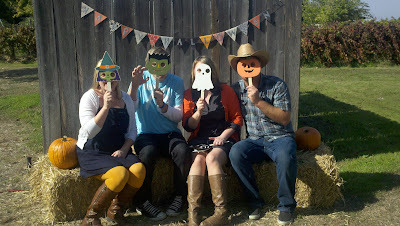 My in-laws were a huge help in the planning, execution and funding of our first Harvest Party. And, lucky for me, my favorite sister-in-law decided to make a surprise visit from Colorado and was a complete life saver when it came to decorating. As I said, I'm no Martha, but I have figured out a few things that have helped me to enhance and simplify party decor. 1. I like to choose a couple of main areas to focus on for decorating. For example, the food table, cake table, or gift table. 4. Props - sometimes it is fun to add props to your photo area. I bought these masks at Joann's for $1 a piece. 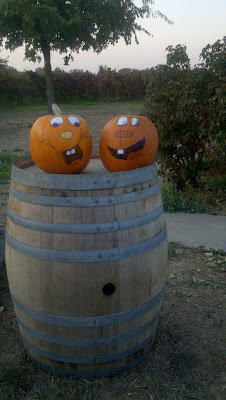 They were plain wooden cutouts, so Sommer and I used acrylic paint and spruced them up a bit. I have seen other people use hats, funny glasses or paper mustaches attached to wooden dowels. If you have a more formal event, you could actually assign someone to be the photographer for your photo area. 5. Keep decorations simple. I love using mason jars and have seen several fun ideas I would like to try in the future. You can use large mason jars as pitchers or vases and small jars to hold any number of fun things or use as drinking glasses for lemonade or another pretty beverage. If time allows, adding ribbon, twine or other embellishments to your jars is a great idea. I got a set of 12 mason jars for $12 at a hardware store, but if you play your cards right you can get them at yard sales for much cheaper. I have also seen them in bulk at Walmart and individually at Michaels and Joanns. 6. Personally, I like using solid color tablecloths and plates and then sprucing that up with fun fabric squares or other accents. I also like decorating with picture frames - you can frame pictures of your guest of honor or pictures from the internet that accent your theme. Google images is my life saver - I use it for inspiration regularly. I bought cheap wooden frames for a $1 at Joanns and now paint them to fit party colors or in other home decor projects. 7. Have a bounce house. We got a great deal on the bounce house rental and it was totally worth it! 8. Have a great time and enjoy yourself! It's such a blessing to look around and see so many people you care about in one place. 9. Splurge on something you really want that you will enjoy during the party and beyond. For me it was two wine barrels from a guy on craigslist. 10. Bunting* - it's no secret how much I love bunting (those little triangle signs in the photo below). There are so many different ways you can create it and it is so simple! I will be really sad when it goes out of style. 11. Experiment with different levels and heights on your main tables and let existing items like the food/utensils/gifts/cakes serve as your decor. I use empty boxes to add different heights. If you have crates, those work really well too. I didn't think this idea through in advance this time around and ended up improvising at the last minute. Looking back, I should have put cute little pumpkins or votives underneath the upside down compote bowls. 12. Remember to take pictures of your loved ones early. Just like the "LJ First Birthday" fiasco of 2010 where we neglected to take a photo of all three of us; we didn't get any pictures of our family together at this party. I intended for us to take our holiday photos after the party was over, but by the time I wrangled JP and LJ, we were past the point of no return. This was the only family photo we got. Clearly not the warm holiday greeting I was hoping for. *I should point that Sommer made all of the bunting for the party. I gave her my inspiration and she executed it for me far better than I could have done myself. I love my crafty sister! Still sad I couldn't make it! Are you having a bday party for LJ this year? No party for the Lukester this year! His bday is on Thanksgiving, so we're pretty much sticking to family celebrations this year. The harvest party was enough for one season!